View The Gallery of A-Model Steel Buildings! The A-Model building makes the ideal residential hobby shop or man-cave you have been planning for years. Since it is designed for a simple, fast construction, you don't need to hire expensive skilled laborers and you can save thousands. Standard models range from 16 to 40 feet wide and are available in unlimited lengths. Custom widths can be manufactured for special applications or existing concrete pads. The high sidewall clearance and trussless roof design make the A-model perfect for workshops, recreational vehicle storage and auto body shops where commercial lifts may be needed. The A-model is manufactured in a state of the-art facility with the most modern robotics technology. This allows for less labor requirements to produce your building and these savings are directly passed on to you. The precision manufacturing and superior strength of the engineered sidewall design make these models easy to erect and durable in heavier snow conditions. 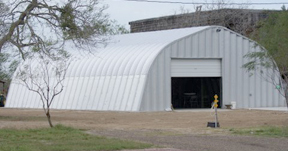 Once fully erected you will have the peace-of-mind that your valuables are secure and protected by the strongest arch steel building available anywhere. The A-Model features a 4:12 roof pitch with a great sidewall clearance. The pitched roof with slightly slanted sidewall combine to make this beautiful gambrel style design. Ideal for workshops, garages, camper and RV storage. Totally preengineered and prefabricated for the most simple and fastest metal building construction.